Change is hard. Extension dietitian makes it easier. Telling people to change what they put on their plate can be a challenge, but not impossible. For many lucky Oregonians, Stephanie Polizzi has found the winning combination of creative and evidence-based instruction to help them make life-altering changes. When Stephanie joined OSU Extension in August 2005 as a registered dietitian, she filled an unmet need by teaching community nutrition and wellness programs in Coos and Curry counties. “Thirteen years later, I am still the only community dietitian in both counties,” Stephanie says. To date, she’s led more than 725 nutrition and health classes at worksites, medical centers, schools, civic groups and senior centers, reaching more than 20,000 residents. Just a year after Stephanie stepped into her position, she helped a woman turn her life around. A participant in one of her courses had Type 1 diabetes for 40 years and was told by her doctors she only had weeks to live. The participant, who has moved from Coos County, keeps in touch with Stephanie and tells her of the classes she is leading at her church to help others improve their health through food. Beyond individual success stories, Stephanie is helping the residents of Coos County warm up to diet and nutrition information. In 2017, Stephanie became chair of The Healthy Eating Active Living Committee (HEAL) and created the Healthy Bytes Initiative. Through the Healthy Bytes Initiative, community partners, such as Natural Grocers, Bay Area Hospital and Southern Coos Hospital, Stephanie displays information about one plant-food each month. She says the goal is to unify health information across community organizations. The program also engages a variety of sectors including restaurants, businesses and faith-based organizations. Stephanie is most proud of her Wellness Ink newsletter and the lifestyle medicine program she created, Lifestyle Eating Activity and Progress (LEAP). In LEAP, Stephanie taught nutrition programs that emphasized the importance of eating plant-based foods to protect against chronic disease. Participants experienced decreased joint pain and increased energy, and after 30 days their lab results indicated they had significantly lowered their risk factors for chronic disease. Before coming to Oregon State, Stephanie owned her own nutrition consulting business on the East coast. Although she offered nutrition therapy and health coaching, she felt ineffective. The individual and community-level changes resulting from Stephanie’s work proves she is indeed making a permanent impact. Individuals who have changed their own eating behaviors are encouraging others to do the same, and community organizations are sharing healthy lifestyle information. Stephanie may have reached 20,000 residents through her classes, but it’s clear she’s reaching exponentially more. 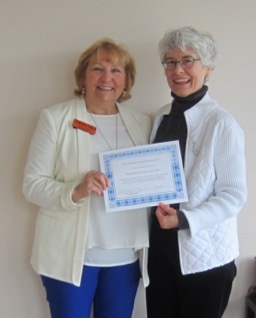 Stephanie Polizzi with Frances Smith, retired director of Coos County Public Health. In recognition of her work, Stephanie has been awarded a Certificate of Achievement from the Coos County Board of Commissioners.